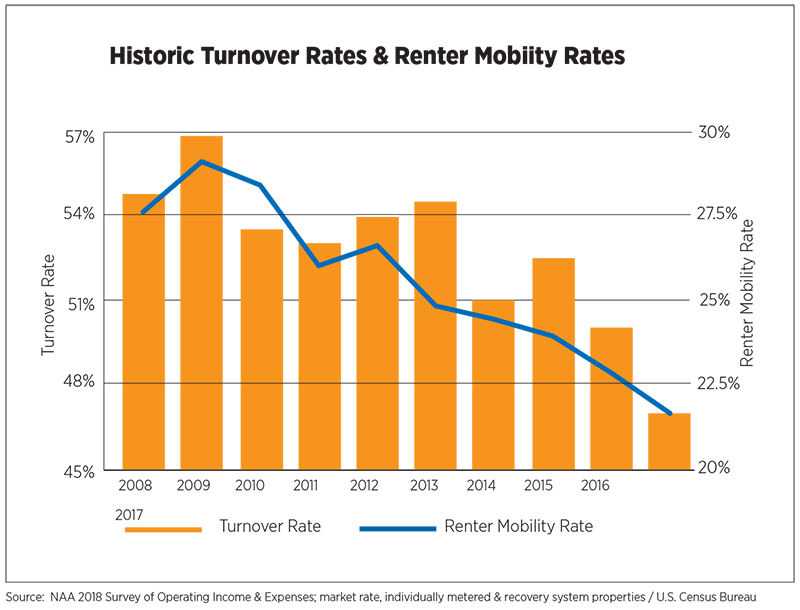 …turnover rates sank to their lowest point on record (data available from 2000) at 46.8 percent. Owners strived to lower turnover costs by focusing on resident retention and increasing renewal rates. The U.S. Census Bureau reported a similar historic low in renter mobility rates in 2017 (21.7 percent) compared to 35.2 percent in 1988. Operating expenses increased by 2.1 percent, the slowest rate of growth since 2013. Net Operating Income (NOI) grew by 5.8 percent, up 2 percentage points over 2016, impressive amid slowing rent growth. Increases in payroll expenses were in line with wage growth in other private sector industries, averaging 2.4 percent. 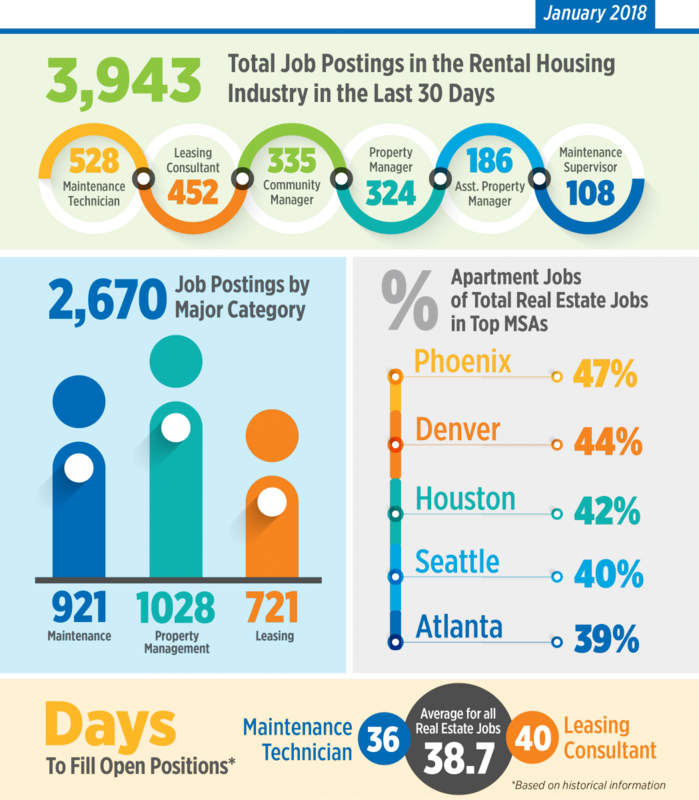 The number of market-rent garden-style units per full-time employee increased for the third consecutive year to 44.3. The challenges of an ongoing labor shortage within the industry likely kept some communities understaffed throughout the year. Increased pressures on wages can be expected in 2018 and should be evident in next year’s survey results. Once again, property taxes were responsible for the largest increase in expenses, up 5.3 percent year-over-year. The average property tax bill was $1,833 per unit and represented one-third of expenses. Fifteen years ago, property taxes comprised less than one-quarter of operating outlays. Contesting assessed values has become commonplace for many owners feeling the squeeze from skyrocketing taxes. Click here to read the full Executive Summary and click here to order a copy of the survey results, which provide breakdowns for each metro market. It’s looking more certain that Hurricane Florence will be impacting the Triad area – our homes and the homes of our residents. You can find updated information on the predicted track of the hurricane HERE. The National Apartment Association has provided many resources on their website for addressing emergencies and disasters. We have also gathered a few key tips for preparing from the website and listed them below. Many use prior experience with hurricanes to judge whether or not to ride it out, but each storm is different. Pay close attention to the National Weather Service and local law enforcement. Consider distributing a pamphlet with precautions to take, including information about food spoilage from power outages and clearing patios of furniture and projectiles. Trim trees, lower the levels of swimming pools and turn the pumps off, open electronic access gates, stow pool furniture, umbrellas, or anything that can become a projectile in high wind. There can be no predicting how long it may take for power to return or for the city to respond to fallen trees and limbs. Have residents fill their bathtubs with water and stock up on batteries and flashlights. Remind residents of the danger of open flame or gas indoors. You’ll need to alert residents on the condition of the community. Also, consider posting updates on your website or social media. Growing (some would say exploding) elderly population. 10,000 baby boomers turn 65 every day. Financial constraints. Independent living communities are significantly more expensive than most market-rate apartments. Not seeing health conditions as serious, or unlikely to improve, and as a result, believing that they don’t need the additional services provided by senior living facilities. Corinne also provided some tips on how to recognize some indicators that a resident might be struggling or need professional care services, as well as a list of resources to which community managers can refer the resident or the resident’s family members. We will likely have Corinne lead another session in Greensboro in the near future so keep an eye out for the calendar announcement. Have a conversation, not an interrogation. Too often we’re asking question, question, question, question. Interview. Interview. Interrogate. This is a very scary thing when you’re on the buying side. Have a conversation with the person that you’re talking with. Focus on the prospective resident. Pay attention to the prospect and treat them like a person. Don’t treat them like a guest card. Don’t treat them like a tour. Don’t treat them like a number. Focus on them, pay attention to them, and listen to what they are saying. Interact with them the way you would want to be treated if you were in their situation. Make them feel like they matter, and you’ll see a tremendous difference. Start and finish the tour strong. Your prospective resident will be impacted most by what you do at the beginning of the tour (it “frames” the rest of the tour) and the last thin you do (it’s what they’ll most likely remember). You can find the rest of the tips here. Emotional Service Animal Tips from the Airlines? It recently announced changes to increase scrutiny about its passengers flying with service or comfort animals — Delta says it flew 250,000 of such animals last year, which was a 150 percent increase over 2016. Incidents reported of those animals biting or defecating during flights had nearly doubled since 2016. 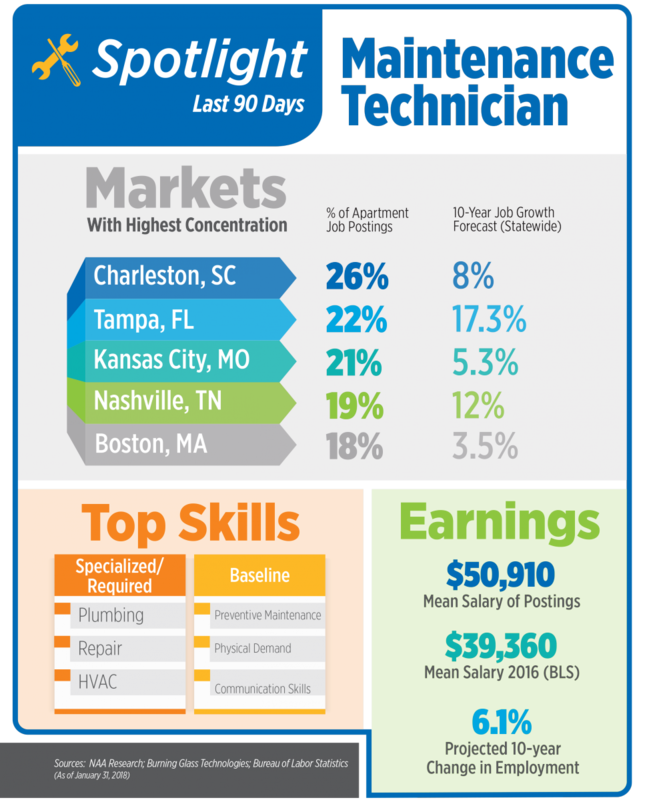 The Apartment Jobs Snapshot is a new monthly product from NAAEI highlighting labor force trends in the rental housing industry. It examines the total job posting trends by position, category and geography, as well as providing fresh and detailed updates for industry employers. The snapshot will feature enhanced quarterly editions with more expansive data, starting in April 2018. With Dec. 24 falling on a Sunday, and with the largest carriers (UPS, FedEx and the United States Postal Service) having announced last week their potential challenges to meeting retailers’ “promised” delivery dates, the situation for communities has become one of reminding residents about office hours and their late-arrival options such as bringing them to the doorstep or gaining approval to set them inside the apartment. Based on informal inquiries by NAA, most apartment communities will stay open a bit later on Saturday Dec. 23 and many will open for part of Dec. 24. Let’s add psychologist to the list of revenue manager qualities, because the phrase, “tell me more about that”, should be a common request as one sleuths out the implications of seemingly innocuous comments heard on pricing calls.